Many Bozeman citizens stood up for their own opinions on the fluoride in the water issue at the City Commission meeting on Monday night. Hail damage to the Bozeman Public Library from the 2010 storms will be repaired over the summer. The project, originally expected to be over one million dollars, will come in around $440,000 and insurance will cover the cost. Valley Glass will be replacing the damaged skylights with the same system now in use. The windows’ high R-value, the measure of how well they insulate, will help maintain the building’s LEED certification. According to their proposal to Martel Construction of Bozeman, the cost will be $146, 000. Light bulbs are being screwed in and cabinet handles attached as the Montana EcoSmart house project nears completion. In September 2010, a groundbreaking ceremony for the project occurred, supported by Montana State University and REHAU Incorporated. On April 20, 2012 ,the project home will host an opening ceremony to celebrate the unique collaborations involved. Ongoing functions at the home will be used to garner support for future endeavors. The Stockyard Café sits on the outskirts of Bozeman on a dirt road that sees little traffic. It’s weathered bright red wood siding contrast with the stark surroundings of the abandoned Bozeman Cattle Yard. What was once a bustling area of activity where cattle sales took place has now become desolate because there have been no cattle sales in the past 10 years at the cattle yard. Submissions are in and this year’s Student Research Celebration projects will provide attendees a diverse amount of topics to learn about, spanning from local to global and a vast majority of colleges here on campus, according to Scarlet Reierson, program administrator for American Studies at Montana State University. This year the conference received roughly 250 abstract submissions, according to Reierson, and the range of projects is the “coolest” thing about the celebration to her. She said students have done research on a local level, such as a documentary about local foods in the Gallatin County, to the international, Engineers without Borders’ experience and field research. This year marked Bozeman Running Company’s Fifth Annual Run to the Pub, to Pub 317 in downtown Bozeman, on Saturday, March 17. The race attracted nearly 2,000 runners from all kinds of running backgrounds to participate in an early-season 10K and half-marathon. The countdown has begun. Presentations are being practiced, finalized, and sweated over, suitcases and homework are being packed, and professors notified of academic absences. What’s all the fuss about? Didn’t everyone just return from spring break? The event is the National Conference for Undergrad Research, an event hosted by a different university each year. This year the host college is Weber State University, in Ogden, Utah, where undergraduate students from the world over will gather to share their research. Zuzu Feder, currently a graduate student, presented at the 2010 conference in Missoula. The world will be watching – or at least the citizens and students of Bozeman plan to this upcoming weekend when predicted blockbuster “The Hunger Games” opens at midnight on March 23. The bestselling book trilogy turned feature film is attracting fans from all over the valley who are enraptured by this post-apocalyptic novel that disturbingly mirrors the present state of American government and culture. The floatation, or sensory deprivation, tank at Sea of Tranquility, which opened locally in January. 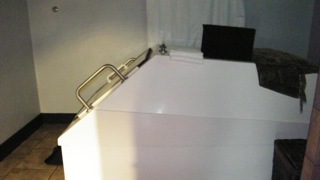 This environment gives the occupant complete buoyancy and a complete lack of outside stimulation or distraction.A floatation tank, or sensory deprivation tank, is 8 feet long by 5 feet wide by 5 feet tall and is filled with 10 inches of water, 800 pounds of Epsom salts and is heated to 93.6 degrees – skin temperature. Once settled in the tank, one’s mind is free to wonder or achieve deep meditation. Research shows that two hours of floating is equal to eight hours of full sleep and rest.